Elizabeth Peratrovich, president of the Alaska Native Sisterhood, testifies before the Alaska Territorial Legislature as it debates anti-discrimination legislation. Peratrovich, whose Tlingit name is Kaaxgal.aat, had experienced segregation in her home town, Juneau, where signs posted in busineses read “No Natives Allowed,” “We cater to white trade only,” “No Dogs, No Natives,” “Meals at all hours — All white help.” The law she championed help end these practices. In 1988, the Alaska legislature declared February 16 (the day the Anti-Discrimination Act was signed) Elizabeth Peratrovich/Alaska Civil Rights Day. 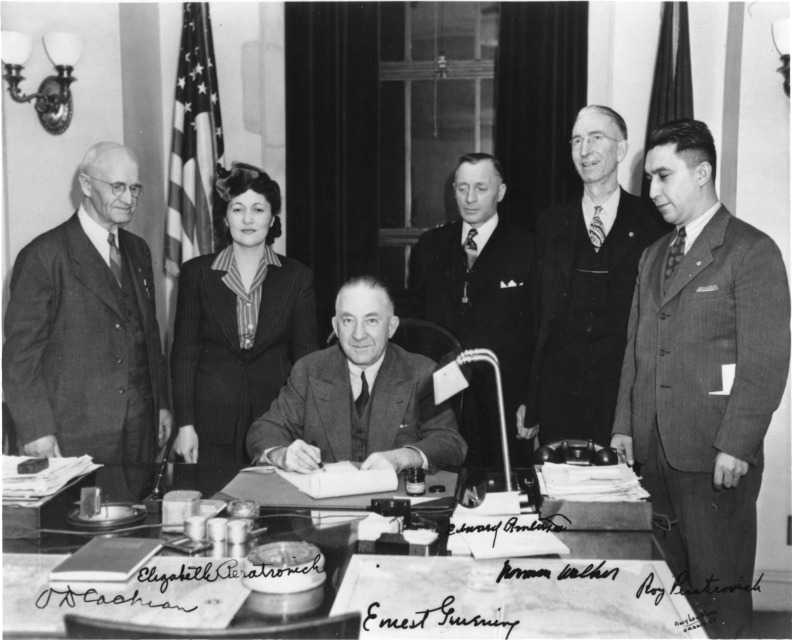 Alaska Governor Ernest Gruening (seated) signs the Anti-Discrimination Act of 1945. Witnessing are (left to right): O.D. Cochran, Elizabeth Peratrovich (president of the Alaska Native Sisterhood), Edward Anderson, Norman Walker, and Roy Peratrovich.